This branch of their unwritten literature is both valuable and interesting. These traditions are remarkably tenacious of the truth, and between them all there is a striking harmony of facts. Any one who takes occasion to compare parts of these tradi tions with concurrent history, will be surprised at their accuracy, whether the version be from the Oneida, the Onondaga, the Seneca, or the Mohawk. The embellishments gained by their transmission from hand to hand are usually separable from the substance, and the latter is entitled to credence. In a search for Iroquoian ritual uses for the marine shell beads now called wampum (porcelaine in French), Marshall Joseph Becker and Jonathan C. Lainey identify the White Dog Sacrifice (WDS) as a possible candidate. Many unusual elements of the WDS have led outsiders to record, and often to publish, their observations of various details of these rituals. Since these records of the WDS often mention the use of wampum, and ethnographic accounts of wampum as part of any religious contexts are extremely rare, the authors focus their study on descriptions of the WDS to see if wampum beads were essential to the ritual. 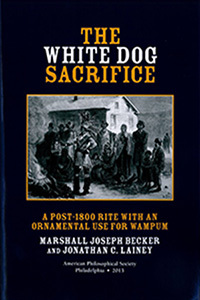 The WDS involved ceremonial sacrifice and subsequent cremation of one, or sometimes two “white” dogs to carry away the sins of native believers. 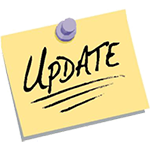 Examination of the accounts recording the WDS reveals that they fall within a narrow range of time and space beginning about 1799. A “string of beads” used to adorn a sacrificed dog also was first noted in 1799, but if these were wampum or glass bead ornaments is not certain. If they were wampum they might have been used to convey a message through the sacrificed dog. By 1800 the rite of the WDS evolved from the previous eating of dogs at feasts into a ritual sacrifice within which wampum may have been only incidentally included. Reports of the WDS among the Seneca and other Iroquoians reveal that this rite emerged early in the nineteenth century. Diplomatic uses for wampum were coming to an end around 1800. The impact of the WDS on reducing wampum supplies was insignificant. More important is the authors’ finding that the WDS was not incorporated into the midwinter rituals of all New York’s Iroquoian people as had been commonly assumed. Also, wampum appears to have been rare or absent from all known Iroquoian ritual activities prior to 1800. Another discovery previously overlooked is the importance of burning of baskets in connection with these Midwinter rituals. Basket burning survived long after the sacrificial offering of dogs ended. Native American sports team mascots represent a contemporary problem for modern Native American people. 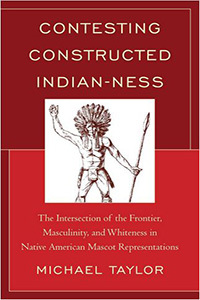 The ideas embedded in the mascot representations, however, are as old as the ideas constructed about the Indian since contact between the peoples of Western and the Eastern hemispheres. Such ideas conceived about Native Americans go hand-in-hand with the machinations of colonialism and conquest of these people. This research looks at how such ideas inform the construction of identity of white males from historic experiences with Native Americans. 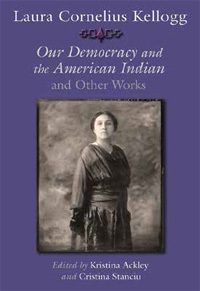 Notions of “playing Indian” and of “going Native” are precipitated from these historic contexts such that in the contemporary sense of considering Native Americans, popular culture ideas dress Native Americans in feathers and buckskin in order to satisfy stereotypic expectations of Indian-ness. 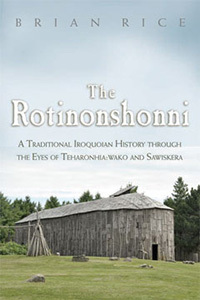 In this book, Rice offers a comprehensive history based on the oral traditions of the Rotinonshonni Longhouse People, also known as the Iroquois. Drawing upon J. N. B. Hewitt’s translation and the oral presentations of Cayuga Elder Jacob Thomas, Rice records the Iroquois creation story, the origin of Iroquois clans, the Great Law of Peace, the European invasion, and the life of Handsome Lake. As a participant in a 700-mile walk following the story of the Peacemaker who confederated the original five warring nations that became the Rotinonshonni, Rice traces the historic sites located in what are now known as the Mississippi River Valley, Upstate New York, southern Quebec, and Ontario. The Rotinonshonni creates from oral traditions a history that informs the reader about events that happened in the past and how those events have shaped and are still shaping Rotinonshonni society today. Kinzua Dam has cast a long shadow on Seneca life since World War II. The project, formally dedicated in 1966, broke the Treaty of Canandaigua of 1794, flooded approximately 10,000 acres of Seneca lands in New York and Pennsylvania, and forced the relocation of hundreds of tribal members. Hauptman presents both a policy study, namely how and why Washington, Harrisburg, and Albany came up with the idea to build the dam, as well as a community study of the Seneca Nation of Indians in the postwar era. Sold to the Senecas as a flood control project, the author persuasively argues that major reasons for the dam were the push for private hydroelectric development in Pennsylvania and state transportation and park development in New York. 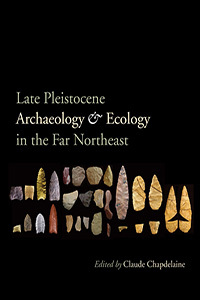 This important study, based on Hauptman’s forty years of archival research as well as numerous interviews with Senecas, shows that these historically resilient Native peoples adapted in spite of this disaster. Unlike previous studies, he stresses the federated nature of Seneca Nation government, one held together in spite of the great diversity of opinion and intense politics. 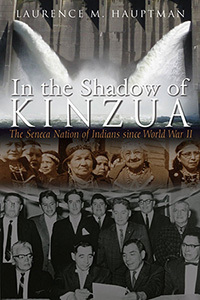 Indeed, in the Kinzua crisis and its aftermath, the Senecas truly had heroes and heroines who faced problems head on and devoted their energies to rebuilding their nation for tribal survival. Without adequate financial resources or college diplomas, they left legacies in many areas, including two community centers, a modern health delivery system, two libraries, and a museum. Money allocated in a "compensation bill" passed by Congress in August 1964 produced a generation of college-educated Senecas, some of whom now work in tribal government making major contributions to the nation’s present and future. Facing impossible odds and forces hidden from view, they motivated a cadre of volunteers to help rebuild their devastated nation. Although their strategies did not stop the dam’s construction, they laid the groundwork for a tribal governing structure and for other areas that followed from the 1980s to the present, including land claims litigation and casinos. When Europeans discovered tobacco among Amerindians in the New World, it became a long-sought panacea of panaceas, the critical ingredient in enemas, ointments, syrups, and powders employed to treat everything from syphilis to cancer. Almost five centuries passed before medical researchers concluded that tobacco is unhealthy and can cause cancer. Smoke Signals follows tobacco from its origins in South America's Andes through its checkered history as a "miracle cure," powerful addictive and poison, friend of government revenue departments, and enemy of law enforcement directed at contraband and tax diversion. 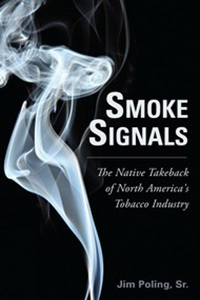 Author Jim Poling, Sr., traces tobacco's sacredness among Natives, notably how the modern substance has changed Native lives, sometimes for the good, often for the bad, explores how the coffers of governments, now so dependent on tobacco revenue, will be affected if the plant's commercial use is eliminated, and examines how Native traditions, including tobacco as a holy herb, might survive in modern society and strengthen Natives.